Moshi town in Kilimanjaro region is where our offices are located. 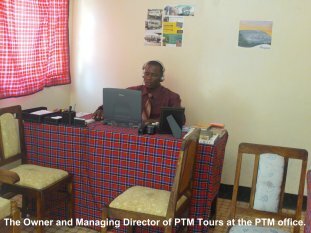 For many years now Peter Tours & Mountaineering (PTM) has done many successful tour operations. 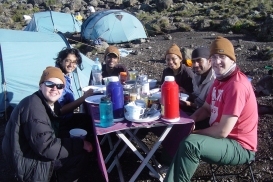 These included conquering the summits, eco-tourism and camping/lodges safaris. The above achievements have been due to experienced personnel and quality standards equipment. The company's Managing Director, Mr. Peter Meela, has been in the tourism industry for years. Peter received his academic tour guide training at schools in Moshi and as a Mountain Guide by working his way through the Tanzania National Park Service's rigorous training course. He has plyed his trade for the past 17 years. Our safaris programs covers all regional parks with more bias on the Northern Circuit. We do organize and coordinate wildlife safaris to Ngorongoro Crater, Lake Manyara , Ngurdoto, Tarangire, Arusha and Serengeti National Parks. Our good relations and partnership with some of the tented camps and lodges found in the Northern Part of Tanzania make it easy for our clients to be given the most welcoming comfort criteria. Apart from these our operations covers organizing trips to the white sands found along the coastline in Tanzania mainland and islands. With this in mind, PTM have not forgotten the idea of handling accommodation, flights, reservations and bookings in Zanzibar –the spice islands and beyond. Bagamoyo not left behind. Climbers interested in summiting Mount Kilimanjaro through the various routes will never regret when doing the same with PTM. Our motto has been and will always be to provide our clients with high quality guiding while ascending and descending this top roof of Africa. Our personnel and equipments can be compared to none. Those who have been with us earlier can prove this. Our promise to clients will always be to provide them with the best services to be in their memories for years. Apart from this we also provide comprehensive bookings services for lodges, camps, coastal resort and hotel bookings not only in Tanzania but beyond in other East African countries. We are also unique to the fact that part of the revenues earned through the above mentioned activities is again ploughed back on projects geared towards community development. PTM have focused much on empowering women economically. With the little we have we have supported several women groups doing tailoring business to support their families. Street children and orphanages have been our main concern. For many years now we have been supporting these children through paying of their respective school fees and at times supplying them with textbooks, exercise books, pens and other types of stationeries. In supporting the community we have also gone a bit far in the sense that for some years now we have been coordinating and implementing the idea of finding placement places for various overseas volunteers who want to come to Tanzania to do volunteering activities/work. We have been and we can arrange for volunteers placement who wants to work in the fields of education, health, environmental protection, HIV/Aids, street children homes and the empowering of women economically.